DCI Resources (The Learning Academy) is an IT Training & Education and Public Testing Center where individuals will learn new skills, upgrade to new technologies and earn certifications to enhance their careers. Certification titles include (MOS) Microsoft Office Specialist®, Internet and Computing Core Certification®, CompTIA (series): A+, Network+, Security+, etc..., Cisco (series): CCNA, CCENT, etc.., (MTA) Microsoft Technology Associate®, (IC3 GS 5) Internet Core Competency Certification, HP Accredited Technical Associate®, Adobe Certified Associate®, Autodesk Certified User®, QuickBooks Certified User®. Through (NRF) National Retail Federation, we also offer Certification in Fundamental / Advanced Customer Service & Sales. Exam vouchers are available onsite or through our website. $40 proctoring fee (per exam) will be assessed for outside exam voucher purchases. Exam re-takes will require an additional $40 proctor fee. Please call ahead to schedule an appointment. Photo ID required for all scheduled exams. We provide career development, exam preparation, certification and licensure testing, group training for businesses, and one-on-one training for individuals pre-approved through supplemental funding source, i.e., corporate account, Department of Labor. 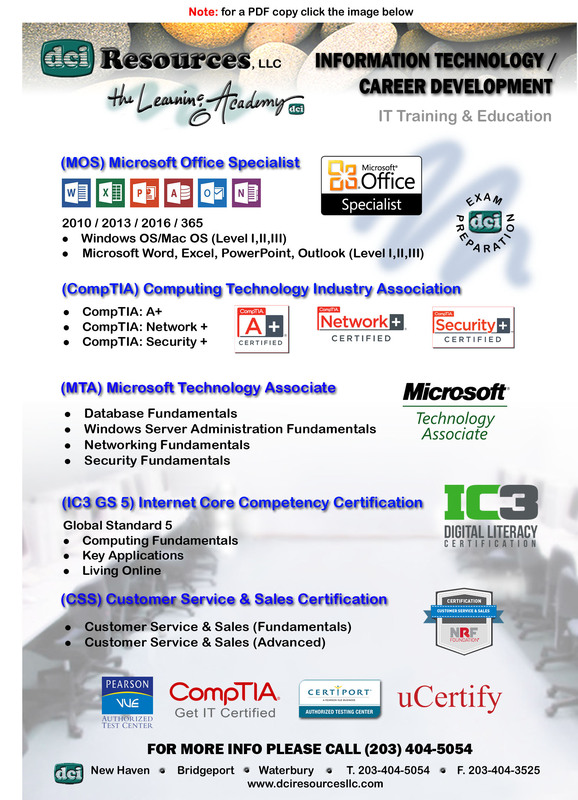 DCI Resources (The Learning Academy) is a leader in the certification testing industry. We provide onsite testing for computer based certification, Pre-employment assessments, and professional licensure exams. Certifications are a great way to break into a new technology, cover gaps in your resume or advance your current position. The best people in the IT business are the ones who are passionate about learning and that is a key to being successful. Technology is evolving at a pace that is difficult to keep up with. As the environment moves forward and changes so must you. Regular education is a must whether it’s back to college, buying a book or getting a certification. Note: DCI Resources (The Learning Academy) offers training & education that is totally contractual. Our participants are provided and vetted directly through private entities, including CTDOL’s workforce development board partners, on a contractual basis. The testing center hours are Monday through Friday from 10:00am to 7:00pm and Saturday by appointment only.